The De Wildt Cheetah Research Centre is famous for the place where the first ever cheetahs were bred in captivity. 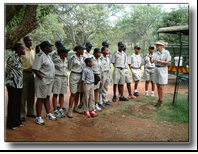 This morning excursion includes a shot power-point presentation and lecture and a walking tour where animals are fed. OPTIONAL EXTRA - Ambassador cheetah experience.